Reheating furnace is important equipment in the process of hot rolling. It is the heart of any hot rolling mill. Reheating of steel is a continuous process. The steel material to be rolled is charged at the entrance of the reheating furnace. The steel material is pushed forward on the hearth of the furnace by means of a pusher machine whose ram is in direct contact with the steel material. The steel material is pre-heated, heated and soaked as it passes through pre-heating, heating and soaking zone of the reheating furnace. At the end of the soaking zone of the furnace, the steel material is discharged from the furnace by ejector for rolling in the rolling mill. The temperature of the heated steel material at the time of discharged depends on several factors and it can vary in the range of 1100 deg C to 1250 deg C.
The size of the reheating furnace is normally expressed as the capacity to supply the rolling mill with sufficiently hot steel, in tons per hour. Steel materials with different material compositions, dimensions, and charging temperatures can reside in the furnace simultaneously. The reheating furnace used for heating the steel materials is normally considered to be having high energy consumption. It also emits good amount pollutants in the atmosphere because the process used for heat generation is the combustion process. Reheating process has considerable influence on the economics of the working of the rolling mill. There are usually three types of continuous reheating furnaces used in the rolling mills. These are (i) pusher type furnace, (ii) walking hearth furnace, and (iii) walking beam furnace. Pusher type furnaces have some disadvantages which includes (i) frequent damage of refractory hearth, (ii) skid marks on the heated steel material, (iii) energy losses because of the water cooling of the skids, (iv) supporting structure for the steel material in top and bottom fired furnaces has a detrimental effect on energy use, (v) discharge of the steel material is to be accompanied by the charging of the material, (vi) the size and weight of the steel material and furnace length are limited by friction and there is possibility of the pile-up of the steel material in the furnace, and (vii) there is no possibility of heating the steel material from all the four sides. The reheating furnace heats the charged steel material to the rolling temperature for its hot rolling in the rolling mill. Rolling temperature is that temperature which makes the steel charge suitable for the plastic deformation in the rolling process. For this, the steel is to have temperatures where its microstructure is in the austenitic range. The steel to be rolled is usually in the form of billets, blooms, or slabs. Its shape can be square, rectangular, flat or round. It forms the charge bed of the furnace. The furnace can be either top fired or top and bottom fired. The burners can be located at the furnace end, furnace sides, or at the furnace roof. The reheating furnace can use either liquid fuel, gaseous fuel or solid fuel. The burners are located in a manner so as to achieve uniform heat distribution. The normal or conventional heating method in the reheating furnace for the heating of the steel material to the rolling temperature is to heat the steel in the furnace which is being fired by burners operating at or slightly above the stoichiometric ratio of the fuel being used. The 100 % stoichiometric ratio is defined as the air/fuel ratio that yields perfect combustion of the fuel and yields a gaseous atmosphere in the furnace which is made up of only nitrogen (N2), carbon di-oxide (CO2) and water vapour (H2O). Combustion at an air/fuel ratio slightly above 100 % stoichiometric results in a small percentage of oxygen (O2) in the gaseous atmosphere of the furnace. Also, because of high temperatures existing in the furnace, some percentage of N2 gets converted into oxides of nitrogen. During the traverse of the steel material through the furnace, energy is transferred to the steel material by means of convection from the hot burner gases which are in direct contact with the steel material and by means of radiation from the heated furnace walls and heated furnace roof. Energy transfer within the steel material takes place by conduction. The transfer of the heat energy by the radiation is the most efficient way of the transfer of the heat energy. Radiation transfer of heat energy takes place through the useful heat transfer area created by the bed of the steel material. The main components of a reheating furnace consist of (i) a chamber constructed of refractory and insulating materials for retaining heat at the high operating temperatures, (ii) a furnace hearth for supporting and carrying the steel, (iii) a set of burners which may use solid, liquid, or gaseous fuel for raising and maintaining the temperature in the chamber, (iv) a system for the removal of the combustion exhaust gases from the chamber, and (v) systems for the introduction and removal of the steel material from the furnace chamber. As stated earlier, the furnace is basically divided into three zones namely (i) preheating zone, (ii) heating zone, and (iii) soaking zone. In the preheating zone, the charged steel material is preheated. The role of the preheating zone is to increase the temperature of the steel material progressively. Slow heating of the steel surface initially is necessary for the control of the thermal stresses in the steel material. In the heating zone the surface temperature of the steel material is raised rapidly. 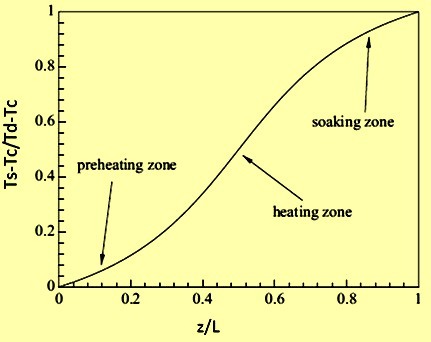 The majority of heat absorption by steel material is accomplished in this zone. In the soaking zone, the internal temperature of the steel material is controlled so as to have as far as possible a uniform temperature throughout the cross section of the steel material. The temperature of this zone is progressively increased so as to have the target or desired discharging temperature for the steel material. In the reheating furnace, the major amount of heating takes place in the heating zone. The temperature uniformity up to desired limits between the core and the surface of the steel material is achieved in the soaking zone. The flue gases move in a direction opposite to that of the steel material and thus ensures considerable amount of waste heat recovery by convection in the preheating zone. Preheating zone is also sometimes called the recuperative zone. The velocity and the retention time of the exhaust gases in the furnace are important for the effective transfer of its sensible heat to the steel material. The reheating furnace is required to be highly fuel efficient. It needs to have (i) proper roof profile, (ii) effective zonal heat distribution, (iii) optimum length of preheating zone for the transfer of recuperative heat, (iv) proper location of burners, (v) proper location of the exit port for the exhaust gases, (vi) liberation of sufficient heat within the furnace chamber to heat the steel material and overcome all heat losses, (vii) effective transfer of available part of the heat from the furnace gases to the surface of steel material being heated, (viii) proper insulation to have minimum furnace skin temperature, (ix) effective control of the furnace chamber pressure for eliminating the atmosphere air ingress, (x) necessary instrumentations for the control of important furnace parameters , (xi) equipments for the recovery of waste heat, and (xii) equipment for emission control. The basic operation requirements of reheating furnaces include (i) to achieve the desired minimum temperature needed for the rolling of steel consistently, (ii) to minimize the difference of temperature between the surface, the core, and along the length of the steel material to a desired level of 15 deg C to 25 deg C, (iii)) to minimize the cold spots also known as skid marks in the steel charge, (iv) to avoid overheating and burning of the steel, (v) to minimize the scale formation, (vi) the minimize the decarburization at the steel surface, (vii) to avoid thermal stresses and cracks in the charge material, (viii) to eliminate scratches on the bottom surface of the steel material, (ix) to have low energy consumption and minimal heat losses from the furnace, (x) to have maximum recovery of sensible heat of the exhaust gases, (xi) to have low combustion generated emissions, and (xii) to have simple and easy control functional system. Thermal efficiency of the reheating furnace is defined as the increase of the heat content of the steel charge, when heating from initial temperature to the rolling temperature, divided by energy provided by the fuel which includes both the latent energy as well as plus sensible heat energy. Reheating furnace consumes around 70 % to 80 % of total energy consumption of rolling mill having a continuous pusher type of reheating furnace. The pusher type furnace suffers from the perennial problem of low efficiency. Thermal efficiency of this type of furnace is normally in the range of around 20 % to 30 % since a lot of heat is lost. The loss of heat in the furnace is due to several reasons which include (i) heat stored in the furnace structures, (ii) loss of heat from the furnace outside wall and structures, (iii) heat carried out by implements, tools, and equipment, (iv) heat required for heating the cold air infiltration in the furnace, (v) heat carried by the excess air used for combustion in the furnace, (vi) heat loss in the exhaust gases, (vii) heat losses due to leakages, and (viii) heat loss to the cooling water used for the cooling of the skids. The largest source of heat loss is through the exhaust gases exiting the furnace. The higher the furnace temperature, the greater is the loss through the exhaust gases. The typical heat balance diagram of a pusher type reheating furnace is at Fig 1. Heating of the steel material in the reheating furnace is influenced by the operating practices. Good operating practice has better control on the scale formation, fuel consumption and quality of heating. It also has an impact on the furnace productivity. The factors influencing the operating practice include (i) hearth coverage, (ii) discharge temperature of steel material, (iii) temperature uniformity along the length and cross section of steel material, (iv) control of fuel combustion, (v) control of excess air inflow in the furnace by controlling O2 in the exhaust gas, (vi) control of furnace pressure, and (vii) waste heat recovery. Combustion control optimizes the sensible heat which is absorbed by the steel material. Efficient use of fuel controls the flow of exhaust gas within the furnace atmosphere. The specific consumption of fuel in the furnace is influenced by (i) calorific value (CV) of the fuel, (ii) excess air in the furnace atmosphere, (iii) preheating temperature of the combustion air, (iv) firing zone temperatures, (v) temperature of steel material at the furnace entry, (vi) hearth coverage by the steel material, (vii) discharge temperature of steel material, (viii) heat losses from the furnace, and (ix) mill delays. In case of coal fired reheating furnace, besides CV of the coal, other factors which are important include (i) ash, moisture, and the volatile matter contents of the coal, (ii) consistency of size fraction during pulverizing, (iii) uniform mixing of pulverized coal with the conveying media (combustion air), and (iv) steady feed rate of the pulverized coal to the burner. Pulverized coal is normally conveyed suspended in air. Lean phase conveying method is used. This method normally uses the conveying air as primary air in the burner. In this case, the conveying requirements usually determine the primary air flow. This implies that primary air discharge velocity at the burner nozzle is the only variable which can be used to optimize the momentum and hence the combustion. Pulverized coal is not normally evenly distributed in the conveying air within the pipe. Often severe improper distribution of the coal occurs which is known as ‘roping’. This is not predictable but tends to become more severe the more bends there are in the system and the longer the pipe run. Roping is difficult to detect and quantify but adversely affects the performance of the burner with respect to flame pattern and heat release profile. Waste heat recovery usually has direct and indirect benefits. Direct benefits include (i) improved heating system efficiency with reduction in the specific consumption of fuel, (ii) lower temperature of the exhaust gas leaving the stack, (iii) higher flame temperature because of preheated combustion air, (iv) faster heat up of the steel material in the furnace, and (v) increased productivity of the furnace. Indirect benefits include (i) reduction in air pollution, and (ii) reduction in equipment sizes which in turn also reduces the energy needed to run those equipments..
Once a piece of steel charge is sent into the reheating furnace, it proceeds from entrance, preheating zone, heating zone, soaking zone and to exit, sequentially. In the course of its traveling, the steel surface temperature, which is controlled by the heating curve, with time and the retention time of the steel in the furnace determine the temperature uniformity. Furthermore, the heating curve and retention time affects energy depletion or fuel consumption. The surface temperature distribution is mainly governed by radiation and partially by convective and conductive heat transfer. With the assumption of thermal equilibrium at the steel surface, the typical heating curve (or the steel’s surface temperature) can be represented by an arc-tangent function. The surface temperature distribution (Ts) with steel’s location (z) is plotted in Fig 2, in which the curve has been non-dimensionalized and normalized in terms of charging temperature (Tc), discharging temperature (Td) and furnace length (L). Factors which contributes to low heat efficiency of the reheating furnace include (i) the capacity of the furnace not matched with the rolling mill capacity, (ii) inappropriate equipment used for the combustion, (iii) non provision of recuperators or recuperators with inadequate capacity or inefficient recuperator, (iv) non provision or by-pass of air / fuel ratio control system, (v) non provision of automatic temperature control and furnace pressure control systems, (vi) improper maintenance and operation of furnace and combustion system, (vii) heat storage in the furnace structure, (viii) losses from the furnace outside walls or structure, (viii) heat transported out of the furnace by the load conveyors, fixtures, trays, etc., (ix) radiation losses from openings, hot exposed parts, etc., (x) heat carried by the cold air infiltration into the furnace, and (xi) heat carried by the excess air used in the burners.